Apple may not offer a dedicated media center, but the features its hardware and software provide can come pretty close. You can watch movies on a large-screen Mac such as a 24-inch iMac, connect a laptop to your HDTV, or use an Apple TV ( ) to bridge the gap between your Mac and your big-screen TV and stereo system. No matter which method you use, however, the key to running a smooth system is organizing your content. There are a few ways to do so, and in most cases, iTunes is your media repository, and it’s best to put all your music, movies, and videos on one Mac so you can either sync them to your Apple TV or stream them from that device (and on a fast wired network, streaming works great). To get all of your media in one location, you’ll need to choose which Mac will sync with the Apple TV, then start moving music, movies, and photos to it from your other computers. To start with, check how much disk space you’ll need. If you have more media than disk space, you’ll need to get an external hard drive to use for your iTunes library. Terabyte drives are pretty inexpensive these days, so it won’t be onerous to add storage to your Mac. Connect a drive and you can move your existing iTunes library to it by simply copying your iTunes Media (what iTunes 9 calls new iTunes folders) or iTunes Music (if you’ve upgraded from an older version of iTunes) folder to the new hard drive then, in iTunes’ preferences, choose the Advanced tab, and then change the iTunes Media folder location. Click on Change, browse to find the new folder on the external drive, select it, and click on Choose. iTunes may take a few minutes to update the library, and then you’ll have plenty of room. Make sure to check, in the same area of the preferences, Copy Files To iTunes Media Folder When Adding To Library, so all your new content gets added to the external drive. Once you’re set up to welcome a large amount of media, it’s time to start copying the movies, music, podcasts, and audiobooks from your various Macs to the media server. A practical new feature in iTunes 9 ( ) called Home Sharing lets you do this easily. In the Sharing preferences of iTunes, check Look For Shared Libraries, and for each other Mac from which you want to copy music, check Share My Library On My Local Network. After you do this, your media server will see your other libraries in the Shared section of iTunes’ sidebar. Click on one of them to see its contents. (This may take a minute or so to load if it’s a large library.) You’ll see a list of music, movies, and other content. To view just part of the library, click on the disclosure triangle next to the name of the library, then select one of the sub-libraries (Music, Movies, TV Shows, and so on). Now, you still may see some content that you already have on your media server, but you can filter this out by clicking on the Show pop-up menu at the bottom of the window and choosing Items Not In My Library. If you want to copy everything that’s not in your library, just select everything in the window (press Command-A), then click on Import at the bottom right of the iTunes window. Be patient; if you have a lot of media, this could take a long time. 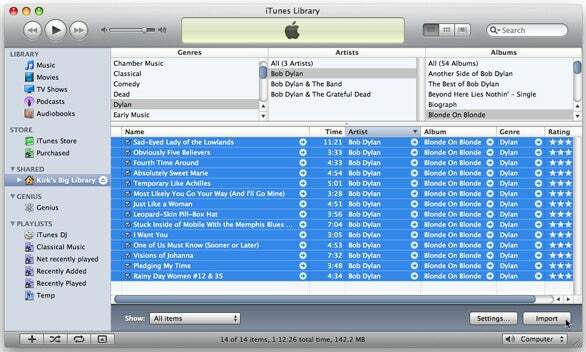 iTunes will not only copy the files, but also add them to the library on your media server. If you only want to copy some content, press Command-B to display iTunes’ browser, and choose genres or artists, then find specific albums or TV series that you want to copy. Once you’ve copied all this content, you can choose to sync it to your Apple TV, or you can simply stream it if there’s not enough room on the Apple TV. With Home Sharing, you can also set up the media server to copy purchased content automatically from other computers to its library. When you have a library mounted, click on the Settings button and choose which types of content to copy. Note that this only works if both the server and the computer whose library you’re connected to use the same iTunes Store account. But the first time you access Home Sharing on a computer, it will prompt you to enter your Apple ID and password and, if needed, you'll be asked to authorize that computer. If, for some reason, you don’t want to copy all of your content to one Mac, you can set your Apple TV to use other libraries than the one it’s synced with. On the Apple TV, choose Settings -> Computers -> Add Shared iTunes Library, then enter the passcode displayed on your TV into iTunes to be able to connect. You’ll be able to stream content from other libraries when you want. This is a good solution if you don’t want, say, all of your kids’ music on your Apple TV, but they want to access it from time to time. While this method works for the Apple TV, it can also be used for a Mac which serves as a media center on its own. If you don’t care about movies and TV shows, then the size of the screen doesn’t matter. You can connect any Mac to a stereo, and play music from iTunes. You can also use Apple’s Front Row (included on all Macs; press Command-Esc to activate it) to browse your music library, and other shared libraries, and choose what you want to listen to. 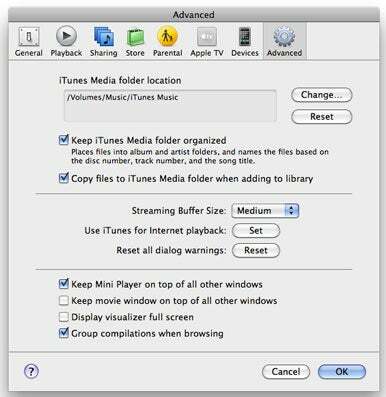 One other advantage to centralizing your media library in this manner is that all other authorized computers will be able to access its complete library (including purchased content) via iTunes, and other Macs will be able to use Front Row to stream content. So while centralizing your library is good for the living room, it also makes sense for all your Macs!